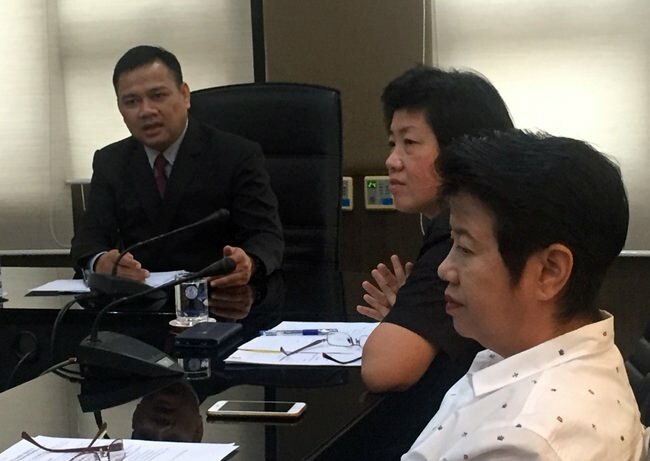 Pattaya Social Development chief Ms. Panee Limcharoen and Deputy City Manager Athipat Yingsiritanyarat discuss ways to help provide for 80-year-old La-lad Manmai and 5-year-old “Palmy”. A mother and daughter have been reunited and a great grandmother who scavenged Pattaya’s streets to earn enough money to support them has been rescued. It’s a happy ending, at least for now, for 80-year-old La-lad Manmai and 5-year-old “Palmy” who made headlines last month with their story of survival. La-lad has been raising Palmy on her own after her son died and his daughter ran off, leaving no one to care for the young girl. The 54-year Pattaya resident was forced to search the streets at 3 a.m. for recyclables instead of enjoying her golden years. After La-lad’s story spread, Ministry of Social Development and Human Security officials directed the Chonburi office to order Pattaya to come to her rescue. They not only contacted La-lad through the Thappraya Community where she lives, they tracked down Palmy’s wayward mother. When Palmy’s father, La-lad’s middle son, died, his daughter – the child’s mother – disappeared, never sending a baht to support her again. The great grandmother not only worried about feeding and clothing the girl, but earning enough to put her in school. Pattaya Social Development chief Panee Limcharoen and Deputy City Manager Athipat Yingsiritanyarat said an education for the child is imperative and told the mother to find her a school and get her enrolled. Social workers, meanwhile, tackled the pair’s living situation. They now live together in a rental room costing 3,500 baht a month and La-lad said she doesn’t want to move. So welfare officials are arranging aid to ensure both great grandmother and child are safe and secure. Pattaya officials said Palmy’s mother offered to retake custody of her daughter, but La-lad demurred, arguing that she raised the girl from infancy and a sudden separation would not be good for the girl. So, for now, they will work out an arrangement that hopefully benefits all.